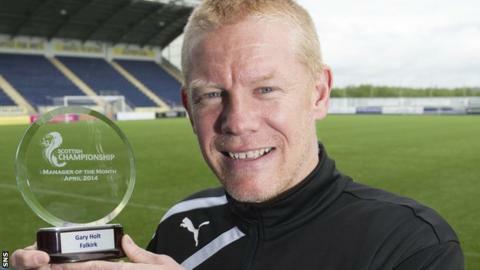 Falkirk manager Gary Holt has been named Scottish Championship manager of the month for April. Holt led his side to three league wins and a draw in April, guiding them to a third-place finish for the season. Falkirk beat Queen of the South 3-1 on Saturday for a 4-3 aggregate win to secure a play-off semi-final against Hamilton Academical. The first leg is on Tuesday and the winners face Hibernian, with a spot in the Premiership up for grabs. Hamilton boss Alex Neil won the manager of the month award for March.